The people of St. Mary of Pine Bluff Catholic Church are spiritually fed with the Body, Blood, Soul and Divinity of Christ in the Holy Eucharist each time the Holy Sacrifice of the Mass is offered. Baptized adults who have not yet received their First Holy Communion should contact Fr. Rick Heilman at 608-798-4644 for more information. Children preparing for their First Holy Communion should enroll in the sacramental preparation classes offered on Sunday mornings during the school year. Since Christ is present under the appearances of bread and wine in a sacramental way, the Blessed Eucharist is unquestionably a sacrament of the Church. Indeed, in the Eucharist the definition of a Christian sacrament as “an outward sign of an inward grace instituted by Christ” is verified. 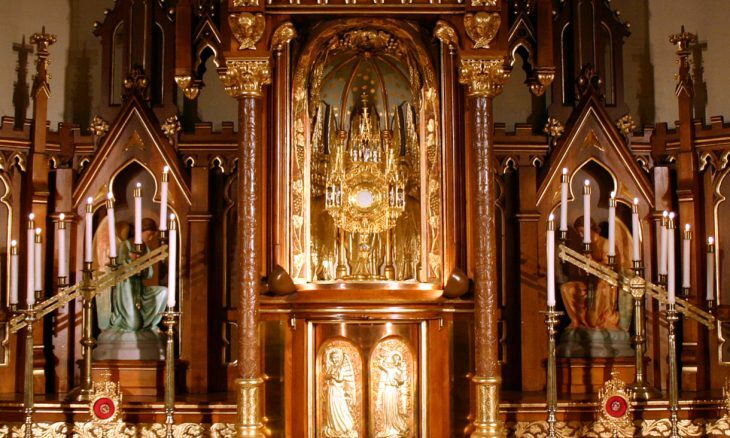 The investigation into the precise nature of the Blessed Sacrament of the Altar, whose existence Protestants do not deny, is beset with a number of difficulties. Its essence certainly does not consist in the Consecration or the Communion, the former being merely the sacrificial action, the latter the reception of the sacrament, and not the sacrament itself. The question may eventually be reduced to this whether or not the sacramentality is to be sought for in the Eucharistic species or in the Body and Blood of Christ hidden beneath them. The majority of theologians rightly respond to the query by saying, that neither the species themselves nor the Body and Blood of Christ by themselves, but the union of both factors constitute the moral whole of the Sacrament of the Altar. The species undoubtedly belong to the essence of the sacrament, since it is by means of them, and not by means of the invisible Body of Christ, that the Eucharist possesses the outward sign of the sacrament. Equally certain is it, that the Body and the Blood of Christ belong to the concept of the essence, because it is not the mere unsubstantial appearances which are given for the food of our souls but Christ concealed beneath the appearances. The twofold number of the Eucharistic elements of bread and wine does not interfere with the unity of the sacrament; for the idea of refection embraces both eating and drinking, nor do our meals in consequence double their number. In the doctrine of the Holy Sacrifice of the Mass, there is a question of even higher relation, in that the separated species of bread and wine also represent the mystical separation of Christ’s Body and Blood or the unbloody Sacrifice of the Eucharistic Lamb. The Sacrament of the Altar may be regarded under the same aspects as the other sacraments, provided only it be ever kept in view that the Eucharist is a permanent sacrament. Every sacrament may be considered either in itself or with reference to the persons whom it concerns. Written by J. Pohle. Transcribed by Charles Sweeney, SJ. (a) The first element is wheaten bread (panis triticeus), without which the “confection of the Sacrament does not take place” (Missale Romanum: De defectibus, sect. 3), Being true bread, the Host must be baked, since mere flour is not bread. Since, moreover, the bread required is that formed of wheaten flour, not every kind of flour is allowed for validity, such, e.g., as is ground from rye, oats, barley, Indian corn or maize, though these are all botanically classified as grain (frumentum), On the other hand, the different varieties of wheat (as spelt, amel-corn, etc.) are valid, inasmuch as they can be proved botanically to be genuine wheat. The necessity of wheaten bread is deduced immediately from the words of Institution: “The Lord took bread” (ton arton), in connection with which it may be remarked, that in Scripture bread (artos), without any qualifying addition, always signifies wheaten bread. No doubt, too, Christ adhered unconditionally to the Jewish custom of using only wheaten bread in the Passover Supper, and by the words, “Do this for a commemoration of me”, commanded its use for all succeeding times. In addition to this, uninterrupted tradition, whether it be the testimony of the Fathers or the practice of the Church, shows wheaten bread to have played such an essential part, that even Protestants would be loath to regard rye bread or barley bread as a proper element for the celebration of the Lord’s Supper. The Church maintains an easier position in the controversy respecting the use of fermented or unfermented bread. By leavened bread (fermentum, zymos) is meant such wheaten bread as requires leaven or yeast in its preparation and baking, while unleavened bread (azyma, azymon) is formed from a mixture of wheaten flour and water, which has been kneaded to dough and then baked. After the Greek Patriarch Michael Cærularius of Constantinople had sought in 1053 to palliate the renewed rupture with Rome by means of the controversy, concerning unleavened bread, the two Churches, in the Decree of Union at Florence, in 1439, came to the unanimous dogmatic decision, that the distinction between leavened and unleavened bread did not interfere with the confection of the sacrament, though for just reasons based upon the Church’s discipline and practice, the Latins were obliged to retain unleavened bread, while the Greeks still held on to the use of leavened (cf, Denzinger, Enchirid., Freiburg, 1908, no, 692), Since the Schismatics had before the Council of Florence entertained doubts as to the validity of the Latin custom, a brief defense of the use of unleavened bread will not be out of place here. Pope Leo IX had as early as 1054 issued a protest against Michael Cærularius (cf. Migne, P. L., CXLIII, 775), in which he referred to the Scriptural fact, that according to the three Synoptics the Last Supper was celebrated “on the first day of the azymes” and so the custom of the Western Church received its solemn sanction from the example of Christ Himself. The Jews, moreover, were accustomed even the day before the fourteenth of Nisan to get rid of all the leaven which chanced to be in their dwellings, that so they might from that time on partake exclusively of the so-called mazzoth as bread. As regards tradition, it is not for us to settle the dispute of learned authorities, as to whether or not in the first six or eight centuries the Latins also celebrated Mass with leavened bread (Sirmond, Döllinger, Kraus) or have observed the present custom ever since the time of the Apostles (Mabillon, Probst). Against the Greeks it suffices to call attention to the historical fact that in the Orient the Maronites and Armenians have used unleavened bread from time immemorial, and that according to Origen (In Matt., XII, n. 6) the people of the East “sometimes”, therefore not as a rule, made use of leavened bread in their Liturgy. Besides, there is considerable force in the theological argument that the fermenting process with yeast and other leaven, does not affect the substance of the bread, but merely its quality. The reasons of congruity advanced by the Greeks in behalf of leavened bread, which would have us consider it as a beautiful symbol of the hypostatic union, as well as an attractive representation of the savor of this heavenly Food, will be most willingly accepted, provided only that due consideration be given to the grounds of propriety set forth by the Latins with St. Thomas Aquinas (III:74:4) namely, the example of Christ, the aptitude of unleavened bread to be regarded as a symbol of the purity of His Sacred Body, free from all corruption of sin, and finally the instruction of St. Paul (1 Corinthians 5:8) to keep the Pasch not with the leaven of malice and wickedness, but with the unleavened bread of sincerity and truth”. (b) The second Eucharistic element required is wine of the grape (vinum de vite). Hence are excluded as invalid, not only the juices extracted and prepared from other fruits (as cider and perry), but also the so-called artificial wines, even if their chemical constitution is identical with the genuine juice of the grape. The necessity of wine of the grape is not so much the result of the authoritative decision of the Church, as it is presupposed by her (Council of Trent, Sess. XIII, cap. iv), and is based upon the example and command of Christ, Who at the Last Supper certainly converted the natural wine of grapes into His Blood, This is deduced partly from the rite of the Passover, which required the head of the family to pass around the “cup of benediction” (calix benedictionis) containing the wine of grapes, partly, and especially, from the express declaration of Christ, that henceforth He would not drink of the “fruit of the vine” (genimen vitis). The Catholic Church is aware of no other tradition and in this respect she has ever been one with the Greeks. The ancient Hydroparastatæ, or Aquarians, who used water instead of wine, were heretics in her eyes. The counter-argument of Ad. Harnack [“Texte und Untersuchungen”, new series, VII, 2 (1891), 115 sqq. ], that the most ancient of Churches was indifferent as to the use of wine, and more concerned with the action of eating and drinking than with the elements of bread and wine, loses all its force in view not only of the earliest literature on the subject (the Didache, Ignatius, Justin, Irenæus, Clement of Alexandria, Origen, Hippolytus, Tertullian, and Cyprian), but also of non-Catholic and apocryphal writings, which bear testimony to the use of bread and wine as the only and necessary elements of the Blessed Sacrament. On the other hand, a very ancient law of the Church which, however, has nothing to do with the validity of the sacrament, prescribes that a little water be added to the wine before the Consecration (Decr. pro Armenis: aqua modicissima), a practice, whose legitimacy the Council of Trent (Sess. XXII, can. ix) established under pain of anathema. The rigor of this law of the Church may be traced to the ancient custom of the Romans and Jews, who mixed water with the strong southern wines (see Proverbs 9:2), to the expression of calix mixtus found in Justin (Apol., I, lxv), Irenæus (Adv. hær., V, ii, 3), and Cyprian (Ep. lxiii, ad Cæcil., n. 13 sq. ), and especially to the deep symbolical meaning contained in the mingling, inasmuch as thereby are represented the flowing of blood and water from the side of the Crucified Savior and the intimate union of the faithful with Christ (cf. Council of Trent, Sess. XXII, cap. vii). In proceeding to verify the form, which is always made up of words, we may start from the dubitable fact, that Christ did not consecrate by the mere fiat of His omnipotence, which found no expression in articulate utterance, but by pronouncing the words of Institution: “This is my body . . . this is my blood”, and that by the addition: “Do this for a commemoration of me”, He commanded the Apostles to follow His example. Were the words of Institution a mere declarative utterance of the conversion, which might have taken place in the “benediction” unannounced and articulately unexpressed, the Apostles and their successors would, according to Christ’s example and mandate, have been obliged to consecrate in this mute manner also, a consequence which is altogether at variance with the deposit of faith. It is true, that Pope Innocent III (De Sacro altaris myst., IV, vi) before his elevation to the pontificate did hold the opinion, which later theologians branded as “temerarious”, that Christ consecrated without words by means of the mere “benediction”. Not many theologians, however, followed him in this regard, among the few being Ambrose Catharinus, Cheffontaines, and Hoppe, by far the greater number preferring to stand by the unanimous testimony of the Fathers. Meanwhile, Innocent III also insisted most urgently that at least in the case of the celebrating priest, the words of Institution were prescribed as the sacramental form. It was, moreover, not until its comparatively recent adherence in the seventeenth century to the famous “Confessio fidei orthodoxa” of Peter Mogilas (cf. Kimmel, “Monum. fidei eccl. orient.”, Jena, 1850, I, p. 180), that the Schismatical Greek Church adopted the view, according to which the priest does not at all consecrate by virtue of the words of Institution, but only by means of the Epiklesis occurring shortly after them and expressing in the Oriental Liturgies a petition to the Holy Spirit, “that the bread and wine may be converted into the Body and Blood of Christ”. Were the Greeks justified in maintaining this position, the immediate result would be, that the Latins who have no such thing as the Epiklesis in their present Liturgy, would possess neither the true Sacrifice of the Mass nor the Holy Eucharist. Fortunately, however, the Greeks can be shown the error of their ways from their own writings, since it can be proved, that they themselves formerly placed the form of Transubstantiation in the words of Institution. Not only did such renowned Fathers as Justin (Apol., I, lxvi), Irenæus (Adv. hær., V, ii, 3), Gregory of Nyssa (Or. catech., xxxvii), Chrysostom (Hom. i, de prod. Judæ, n. 6), and John Damascene (De fid. orth., IV, xiii) hold this view, but the ancient Greek Liturgies bear testimony to it, so that Cardinal Bessarion in 1439 at Florence called the attention of his fellow-countrymen to the fact, that as soon as the words of Institution have been pronounced, supreme homage and adoration are due to the Holy Eucharist, even though the famous Epiklesis follows some time after. The objection that the mere historical recitation of the words of Institution taken from the narrative of the Last Supper possesses no intrinsic consecratory force, would be well founded, did the priest of the Latin Church merely intend by means of them to narrate some historical event rather than pronounce them with the practical purpose of effecting the conversion, or if he pronounced them in his own name and person instead of the Person of Christ, whose minister and instrumental cause he is. Neither of the two suppositions holds in the case of a priest who really intends to celebrate Mass. Hence, though the Greeks may in the best of faith go on erroneously maintaining that they consecrate exclusively in their Epiklesis, they do, nevertheless, as in the case of the Latins, actually consecrate by means of the words of Institution contained in their Liturgies, if Christ has instituted these words as the words of Consecration and the form of the sacrament. We may in fact go a step farther and assert, that the words of Institution constitute the only and wholly adequate form of the Eucharist and that, consequently, the words of the Epiklesis possess no inherent consecratory value. The contention that the words of the Epiklesis have joint essential value and constitute the partial form of the sacrament, was indeed supported by individual Latin theologians, as Toutée, Renaudot, and Lebrun. Though this opinion cannot be condemned as erroneous in faith, since it allows to the words of Institution their essential, though partial, consecratory value, appears nevertheless to be intrinsically repugnant. For, since the act of Consecration cannot remain, as it were, in a state of suspense, but is completed in an instant of time, there arises the dilemma: Either the words of Institution alone and, therefore, not the Epiklesis, are productive of the conversion, or the words of the Epiklesis alone have such power and not the words of Institution. Of more considerable importance is the circumstance that the whole question came up for discussion in the council for union held at Florence in 1439. Pope Eugene IV urged the Greeks to come to a unanimous agreement with the Roman faith and subscribe to the words of Institution as alone constituting the sacramental form, and to drop the contention that the words of the Epiklesis also possessed a partial consecratory force. But when the Greeks, not without foundation, pleaded that a dogmatic decision would reflect with shame upon their whole ecclesiastical past, the ecumenical synod was satisfied with the oral declaration of Cardinal Bessarion recorded in the minutes of the council for 5 July, 1439 (P. G., CLXI, 491), namely, that the Greeks follow the universal teaching of the Fathers, especially of “blessed John Chrysostom, familiarly known to us”, according to whom the “Divine words of Our Redeemer contain the full and entire force of Transubstantiation”. The venerable antiquity of the Oriental Epiklesis, its peculiar position in the Canon of the Mass, and its interior spiritual unction, oblige the theologian to determine its dogmatic value and to account for its use. Take, for instance, the Epiklesis of the Ethiopian Liturgy: “We implore and beseech Thee, O Lord, to send forth the Holy Spirit and His Power upon this Bread and Chalice and convert them into the Body and Blood of Our Lord Jesus Christ.” Since this prayer always follows after the words of Institution have been pronounced, the theological question arises, as to how it may be made to harmonize with the words of Christ, which alone possess the consecrated power. Two explanations have been suggested which, however, can be merged in one. The first view considers the Epiklesis to be a mere declaration of the fact, that the conversion has already taken place, and that in the conversion just as essential a part is to be attributed to the Holy Spirit as Co-Consecrator as in the allied mystery of the Incarnation. Since, however, because of the brevity of the actual instant of conversion, the part taken by the Holy Spirit could not be expressed, the Epiklesis takes us back in imagination to the precious moment and regards the Consecration as just about to occur. A similar purely psychological retrospective transfer is met with in other portions of the Liturgy, as in the Mass for the Dead, wherein the Church prays for the departed as if they were still upon their bed of agony and could still be rescued from the gates of hell. Thus considered, the Epiklesis refers us back to the Consecration as the center about which all the significance contained in its words revolves. A second explanation is based, not upon the enacted Consecration, but upon the approaching Communion, inasmuch as the latter, being the effective means of uniting us more closely in the organized body of the Church, brings forth in our hearts the mystical Christ, as is read in the Roman Canon of the Mass: “Ut nobis corpus et sanguis fiat”, i.e. that it may be made for us the body and blood. It was in this purely mystical manner that the Greeks themselves explained the meaning of the Epiklesis at the Council of Florence (Mansi, Collect. Concil., XXXI, 106). Yet since much more is contained in the plain words than this true and deep mysticism, it is desirable to combine both explanations into one, and so we regard the Epiklesis, both in point of liturgy and of time, as the significant connecting link, placed midway between the Consecration and the Communion in order to emphasize the part taken by the Holy Spirit in the Consecration of bread and wine, and, on the other hand, with the help of the same Holy Spirit to obtain the realization of the true Presence of the Body and Blood of Christ by their fruitful effects on both priest and people. The first and principal effect of the Holy Eucharist is union with Christ by love (Decr. pro Armenis: adunatio ad Christum), which union as such does not consist in the sacramental reception of the Host, but in the spiritual and mystical union with Jesus by the theological virtue of love. Christ Himself designated the idea of Communion as a union love: “He that eateth my flesh, and drinketh blood, abideth in me, and I in him” (John 6:57). St. Cyril of Alexandria (Hom. in Joan., IV, xvii) beautifully represents this mystical union as the fusion of our being into that of the God-man, as “when melted wax is fused with other wax”. Since the Sacrament of Love is not satisfied with an increase of habitual love only, but tends especially to fan the flame of actual love to an intense ardor, the Holy Eucharist is specifically distinguished from the other sacraments, and hence it is precisely in this latter effect that Francisco Suárez, recognizes the so-called “grace of the sacrament”, which otherwise is so hard to discern. It stands to reason that the essence of this union by love consists neither in a natural union with Jesus analogous to that between soul and body, nor in a hypostatic union of the soul with the Person of the Word, nor finally in a pantheistical deification of the communicant, but simply in a moral but wonderful union with Christ by the bond of the most ardent charity. Hence the chief effect of a worthy Communion is to a certain extent a foretaste of heaven, in fact the anticipation and pledge of our future union with God by love in the Beatific Vision. He alone can properly estimate the precious boon which Catholics possess in the Holy Eucharist, who knows how to ponder these ideas of Holy Communion to their utmost depth. The immediate result of this union with Christ by love is the bond of charity existing between the faithful themselves as St. Paul says: “For we being many, are one bread, one body, all that partake of one bread” (1 Corinthians 10:17). And so the Communion of Saints is not merely an ideal union by faith and grace, but an eminently real union, mysteriously constituted, maintained, and guaranteed by partaking in common of one and the same Christ. A second fruit of this union with Christ by love is an increase of sanctifying grace in the soul of the worthy communicant. Here let it be remarked at the outset, that the Holy Eucharist does not per se constitute a person in the state of grace as do the sacraments of the dead (baptism and penance), but presupposes such a state. It is, therefore, one of the sacraments of the living. It is as impossible for the soul in the state of mortal sin to receive this Heavenly Bread with profit, as it is for a corpse to assimilate food and drink. Hence the Council of Trent (Sess. XIII. can. v), in opposition to Luther and Calvin, purposely defined, that the “chief fruit of the Eucharist does not consist in the forgiveness of sins”. For though Christ said of the Chalice: “This is my blood of the new testament, which shall be shed for many unto remission of sins” (Matthew 26:28), He had in view an effect of the sacrifice, not of the sacrament; for He did not say that His Blood would be drunk unto remission of sins, but shed for that purpose. It is for this very reason that St. Paul (1 Corinthians 11:28) demands that rigorous “self-examination”, in order to avoid the heinous offense of being guilty of the Body and the Blood of the Lord by “eating and drinking unworthily”, and that the Fathers insist upon nothing so energetically as upon a pure and innocent conscience. In spite of the principles just laid down, the question might be asked, if the Blessed Sacrament could not at times per accidens free the communicant from mortal sin, if he approached the Table of the Lord unconscious of the sinful state of his soul. Presupposing what is self-evident, that there is question neither of a conscious sacrilegious Communion nor a lack of imperfect contrition (attritio), which would altogether hinder the justifying effect of the sacrament, theologians incline to the opinion, that in such exceptional cases the Eucharist can restore the soul to the state of grace, but all without exception deny the possibility of the reviviscence of a sacrilegious or unfruitful Communion after the restoration of the soul’s proper moral condition has been effected, the Eucharist being different in this respect from the sacraments which imprint a character upon the soul (baptism, confirmation, and Holy orders). Together with the increase of sanctifying grace there is associated another effect, namely, a certain spiritual relish or delight of soul (delectatio spiritualis). Just as food and drink delight and refresh the heart of man, so does this “Heavenly Bread containing within itself all sweetness” produce in the soul of the devout communicant ineffable bliss, which, however, is not to be confounded with an emotional joy of the soul or with sensible sweetness. Although both may occur as the result of a special grace, its true nature is manifested in a certain cheerful and willing fervor in all that regards Christ and His Church, and in the conscious fulfillment of the duties of one’s state of life, a disposition of soul which is perfectly compatible with interior desolation and spiritual dryness. A good Communion is recognized less in the transitory sweetness of the emotions than in its lasting practical effects on the conduct of our daily lives. Though Holy Communion does not per se remit mortal sin, it has nevertheless the third effect of “blotting out venial sin and preserving the soul from mortal sin” (Council of Trent, Sess. XIII, cap. ii). The Holy Eucharist is not merely a food, but a medicine as well. The destruction of venial sin and of all affection to it, is readily understood on the basis of the two central ideas mentioned above. Just as material food banishes minor bodily weaknesses and preserves man’s physical strength from being impaired, so does this food of our souls remove our lesser spiritual ailments and preserve us from spiritual death. As a union based upon love, the Holy Eucharist cleanses with its purifying flame the smallest stains which adhere to the soul, and at the same time serves as an effective prophylactic against grievous sin. It only remains for us to ascertain with clearness the manner in which this preservative influence against relapse into mortal sin is exerted. According to the teaching of the Roman Catechism, it is effected by the allaying of concupiscence, which is the chief source of deadly sin, particularly of impurity. Therefore it is that spiritual writers recommend frequent Communion as the most effective remedy against impurity, since its powerful influence is felt even after other means have proved unavailing (cf. St. Thomas: III:79:6). Whether or not the Holy Eucharist is directly conducive to the remission of the temporal punishment due to sin, is disputed by St. Thomas (III:79:5), since the Blessed Sacrament of the Altar was not instituted as a means of satisfaction; it does, however, produce an indirect effect in this regard, which is proportioned to the communicant’s love and devotion. The case is different as regards the effects of grace in behalf of a third party. The pious custom of the faithful of “offering their Communion” for relations, friends, and the souls departed, is to be considered as possessing unquestionable value, in the first place, because an earnest prayer of petition in the presence of the Spouse of our souls will readily find a hearing, and then, because the fruits of Communion as a means of satisfaction for sin may be applied to a third person, and especially per modum suffragii to the souls in purgatory. As a last effect we may mention that the Eucharist is the “pledge of our glorious resurrection and eternal happiness” (Council of Trent, Sess. XIII, cap. ii), according to the promise of Christ: “He that eateth my flesh and drinketh my blood, hath everlasting life: and I will raise him up on the last day.” Hence the chief reason why the ancient Fathers, as Ignatius (Ephes., 20), Irenæus (Adv. haer., IV, xviii, 4), and Tertullian (De resurr. carn., viii), as well as later patristic writers, insisted so strongly upon our future resurrection, was the circumstance that it is the door by which we enter upon unending happiness. There can be nothing incongruous or improper in the fact that the body also shares in this effect of Communion, since by its physical contact with theEucharist species, and hence (indirectly) with the living Flesh of Christ, it acquires a moral right to its future resurrection, even as the Blessed Mother of God, inasmuch as she was the former abode of the Word made flesh, acquired a moral claim to her own bodily assumption into heaven. The further discussion as to whether some “physical quality” (Contenson) or a “sort of germ of immortality” (Heimbucher) is implanted in the body of the communicant, has no sufficient foundation in the teaching of the Fathers and may, therefore, be dismissed without any injury to dogma. * the necessity of precept (necessitas præcepti). In the first sense a thing or action is necessary because without it a given end cannot be attained; the eye, e.g. is necessary for vision. The second sort of necessity is that which is imposed by the free will of a superior, e.g. the necessity of fasting. As regards Communion a further distinction must be made between infants and adults. It is easy to prove that in the case of infants Holy Communion is not necessary to salvation, either as a means or as of precept. Since they have not as yet attained to the use of reason, they are free from the obligation of positive laws; consequently, the only question is whether Communion is, like Baptism, necessary for them as a means of salvation. Now the Council of Trent under pain of anathema, solemnly rejects such a necessity (Sess. XXI, can. iv) and declares that the custom of the primitive Church of giving Holy Communion to children was not based upon the erroneous belief of its necessity to salvation, but upon the circumstances of the times (Sess. XXI, cap. iv). Since according to St. Paul’s teaching (Romans 8:1) there is “no condemnation” for those who have been baptized, every child that dies in its baptismal innocence, even without Communion, must go straight to heaven. This latter position was that usually taken by the Fathers, with the exception of St. Augustine, who from the universal custom of the Communion of children drew the conclusion of its necessity for salvation. On the other hand, Communion is prescribed for adults, not only by the law of the Church, but also by a Divine command (John 6:50 sqq. ), though for its absolute necessity as a means to salvation there is no more evidence than in the case of infants. For such a necessity could be established only on the supposition that Communion per se constituted a person in the state of grace or that this state could not be preserved without Communion. Neither supposition is correct. Not the first, for the simple reason that the Blessed Eucharist, being a sacrament of the living, presupposes the state of sanctifying grace; not the second, because in case of necessity, such as might arise, e.g., in a long sea-voyage, the Eucharistic graces may be supplied by actual graces. It is only when viewed in this light that we can understand how the primitive Church, without going counter to the Divine command, withheld the Eucharist from certain sinners even on their deathbeds. There is, however, a moral necessity on the part of adults to receive Holy Communion, as a means, for instance, of overcoming violent temptation, or as a viaticum for persons in danger of death. Eminent divines, like Francisco Suárez, claim that the Eucharist, if not absolutely necessary, is at least a relatively and morally necessary means to salvation, in the sense that no adult can long sustain his spiritual, supernatural life who neglects on principle to approach Holy Communion. This view is supported, not only by the solemn and earnest words of Christ, when He Promised the Eucharist, and by the very nature of the sacrament as the spiritual food and medicine of our souls, but also by the fact of the helplessness and perversity of human nature and by the daily experience of confessors and directors of souls. Since Christ has left us no definite precept as to the frequency with which He desired us to receive Him in Holy Communion, it belongs to the Church to determine the Divine command more accurately and prescribe what the limits of time shall be for the reception of the sacrament. In the course of centuries the Church’s discipline in this respect has undergone considerable change. Whereas the early Christians were accustomed to receive at every celebration of the Liturgy, which probably was not celebrated daily in all places, or were in the habit of Communicating privately in their own homes every day of the week, a falling-off in the frequency of Communion is noticeable since the fourth century. Even in his time Pope Fabian (236-250) made it obligatory to approach the Holy Table three times a year, viz, at Christmas, Easter, and Pentecost, and this custom was still prevalent in the sixth century [cf. Synod of Agde (506), c. xviii]. Although St. Augustine left daily Communion to the free choice of the individual, his admonition, in force even at the present day, was: Sic vive, ut quotidie possis sumere (De dono persev., c. xiv), i e “So live that you may receive every day.” From the tenth to the thirteenth century, the practice of going to Communion more frequently during the year was rather rare among the laity and obtained only in cloistered communities. St. Bonaventure reluctantly allowed the lay brothers of his monastery to approach the Holy Table weekly, whereas the rule of the Canons of Chrodegang prescribed this practice. When the Fourth Council of Lateran (1215), held under Innocent III, mitigated the former severity of the Church’s law to the extent that all Catholics of both sexes were to communicate at least once a year and this during the paschal season, St. Thomas (III:80:10) ascribed this ordinance chiefly to the “reign of impiety and the growing cold of charity”. The precept of the yearly paschal Communion was solemnly reiterated by the Council of Trent (Sess. XIII, can. ix). The mystical theologians of the later Middle Ages, as Tauler, St. Vincent Ferrer, Savonarola, and later on St Philip Neri, the Jesuit Order, St. Francis de Sales and St. Alphonsus Liguori were zealous champions of frequent Communion; whereas the Jansenists, under the leadership of Antoine Arnauld (De la fréquente communion, Paris, 1643), strenuously opposed and demanded as a condition for every Communion the “most perfect penitential dispositions and the purest love of God”. This rigorism was condemned by Pope Alexander VIII (7 Dec., 1690); the Council Trent (Sess. XIII, cap. viii; Sess. XXII, cap. vi) and Innocent XI (12 Feb., 1679) had already emphasized the permissibility of even daily Communion. To root out the last vestiges of Jansenistic rigorism, Pius X issued a decree (24 Dec., 1905) wherein he allows and recommends daily Communion to the entire laity and requires but two conditions for its permissibility, namely, the state of grace and a right and pious intention. In the early Christian Era the Peputians, Collyridians, and Montanists attributed priestly powers even to women (cf. Epiphanius, De hær., xlix, 79); and in the Middle Ages the Albigenses and Waldenses ascribed the power to consecrate to every layman of upright disposition. Against these errors the Fourth Lateran Council (1215) confirmed the ancient Catholic teaching, that “no one but the priest [sacerdos], regularly ordained according to the keys of the Church, has the power of consecrating this sacrament”. Rejecting the hierarchical distinction between the priesthood and the laity, Luther later on declared, in accord with his idea of a “universal priesthood” (cf. 1 Peter 2:5), that every layman was qualified, as the appointed representative of the faithful, to consecrate the Sacrament of the Eucharist. The Council of Trent opposed this teaching of Luther, and not only confirmed anew the existence of a “special priesthood” (Sess. XXIII, can. i), but authoritatively declared that “Christ ordained the Apostles true priests and commanded them as well as other priests to offer His Body and Blood in the Holy Sacrifice of the Mass” (Sess. XXII, can. ii). By this decision it was also declared that the power of consecrating and that of offering the Holy Sacrifice are identical. Both ideas are mutually reciprocal. To the category of “priests” (sacerdos, iereus) belong, according to the teaching of the Church, only bishops and priests; deacons, subdeacons, and those in minor orders are excluded from this dignity. Scripturally considered, the necessity of a special priesthood with the power of validly consecrating is derived from the fact that Christ did not address the words, “Do this”, to the whole mass of the laity, but exclusively to the Apostles and their successors in the priesthood; hence the latter alone can validly consecrate. It is evident that tradition has understood the mandate of Christ in this sense and in no other. We learn from the writings of Justin, Origen, Cyprian, Augustine, and others, as well as from the most ancient Liturgies, that it was always the bishops and priests, and they alone, who appeared as the property constituted celebrants of the Eucharistic Mysteries, and that the deacons merely acted as assistants in these functions, while the faithful participated passively therein. When in the fourth century the abuse crept in of priests receiving Holy Communion at the hands of deacons, the First Council of Nicæa (325) issued a strict prohibition to the effect, that “they who offer the Holy Sacrifice shall not receive the Body of the Lord from the hands of those who have no such power of offering”, because such a practice is contrary to “rule and custom”. The sect of the Luciferians was founded by an apostate deacon named Hilary, and possessed neither bishops nor priests; wherefore St. Jerome concluded (Dial. adv. Lucifer., n. 21), that for want of celebrants they no longer retained the Eucharist. It is clear that the Church has always denied the laity the power to consecrate. When the Arians accused St. Athanasius (d. 373) of sacrilege, because supposedly at his bidding the consecrated Chalice had been destroyed during the Mass which was being celebrated by a certain Ischares, they had to withdraw their charges as wholly untenable when it was proved that Ischares had been invalidly ordained by a pseudo-bishop named Colluthos and, therefore, could neither validly consecrate nor offer the Holy Sacrifice. The dogmatic interest which attaches to the minister of administration or distribution is not so great, for the reason that the Eucharist being a permanent sacrament, any communicant having the proper dispositions could receive it validly, whether he did so from the hand of a priest, or layman, or woman. Hence,the question is concerned, not with the validity, but with the liceity of administration. In this matter the Church alone has the right to decide, and her regulations regarding the Communion rite may vary according to the circumstances of the times. In general it is of Divine right, that the laity should as a rule receive only from the consecrated hand of the priest (cf. Trent, Sess. XIII, cap. viii). The practice of the laity giving themselves Holy Communion was formerly, and is today, allowed only in case of necessity. In ancient Christian times it was customary for the faithful to take the Blessed Sacrament to their homes and Communicate privately, a practice (Tertullian, Ad uxor., II, v), to which, even as late as the fourth century, St. Basil makes reference (Ep. xciii, ad Cæsariam). Up to the ninth century, it was usual for the priest to place the Sacred Host in the right hand of the recipient, who kissed it and then transferred it to his own mouth; women, from the fourth century onward, were required in this ceremony to have a cloth wrapped about their right hand. The Precious Blood was in early times received directly from the Chalice, but in Rome the practice, after the eighth century, was to receive it through a small tube (fistula); at present this is observed only in the pope’s Mass. The latter method of drinking the Chalice spread to other localities, in particular to the Cistercian monasteries, where the practice was partially continued into the eighteenth century. The two conditions of objective capacity (capacitas, aptitudo) and subjective worthiness (dignitas) must be carefully distinguished. Only the former is of dogmatic interest, while the latter is treated in moral theology (see COMMUNION and COMMUNION OF THE SICK). The first requisite of aptitude or capacity is that the recipient be a “human being”, since it was for mankind only that Christ instituted this Eucharistic food of souls and commanded its reception. This condition excludes not only irrational animals, but angels also; for neither possess human souls, which alone can be nourished by this food unto eternal life. The expression “Bread of Angels” (Ps, lxxvii, 25) is a mere metaphor, which indicates that in the Beatific Vision where He is not concealed under the sacramental veils, the angels spiritually feast upon the God-man, this same prospect being held out to those who shall gloriously rise on the Last Day. The second requisite, the immediate deduction from the first, is that the recipient be still in the “state of pilgrimage” to the next life (status viatoris), since it is only in the present life that man can validly Communicate. Exaggerating the Eucharist’s necessity as a means to salvation, Rosmini advanced the untenable opinion that at the moment of death this heavenly food is supplied in the next world to children who had just departed this life, and that Christ could have given Himself in Holy Communion to the holy souls in Limbo, in order to “render them apt for the vision of God”. This evidently impossible view, together with other propositions of Rosmini, was condemned by Leo XIII (14 Dec., 1887). In the fourth century the Synod of Hippo (393) forbade the practice of giving Holy Communion to the dead as a gross abuse, and assigned as a reason, that “corpses were no longer capable of eating”. Later synods, as those of Auxerre (578) and the Trullan (692), took very energetic measures to put a stop to a custom so difficult to eradicate. The third requisite, finally, is baptism, without which no other sacrament can be validly received; for in its very concept baptism is the “spiritual door” to the means of grace contained in the Church. A Jew or Mohammedan might, indeed, materially receive the Sacred Host, but there could be no question in this case of a sacramental reception, even though by a perfect act of contrition or of the pure love of God he had put himself in the state of sanctifying grace. Hence in the Early Church the catechumens were strictly excluded from the Eucharist.